In ‘The Day After Tomorrow’, Peter writes about an exponentially changing world and its consequences for organizations of Today. He introduces those pioneers who managed to move (way) beyond Tomorrow-thinking in innovation and were able to change the course of entire industries. Above all, he writes about the business models, the organizational structures, the talent, the mind-set, the technologies and the cultures needed to maximize our chances for survival in 'The Day After Tomorrow'. "Peter Hinssen tells us, in his own inimitable way, how we must adapt to an increasingly digital world. But it’s not just about tomorrow, it is about taking the long view – for what comes after. Technology, and more importantly, human behavior are changing. This book will help you think differently about the world." "Peter provides a thought-provoking, long-term view on the unrelenting pace of change of technology and outlines the imminent opportunities and threats for those businesses that choose to embrace or ignore it." "Peter Hinssen has done it again! ‛The Day After Tomorrow’ is a provocative and inspiring book that will challenge you, educate you and open your eyes to possibilities that you never thought existed! It is a must-read for any organization that wants to prepare for the disruptive changes that are on the way." "Other futurists entice us with fanciful notions. Peter Hinssen, in this insightful book, manages the impossible, combining a stunning clear vision of the future with a compelling but concrete framework to act now. " "The ‛Day After Tomorrow’ is an inspiring survival guide for those who want real insights into radical innovation and long-term thinking. I especially appreciated Peter’s strong focus on the role of organizational culture when it comes to ‛Day After Tomorrow’ innovation." 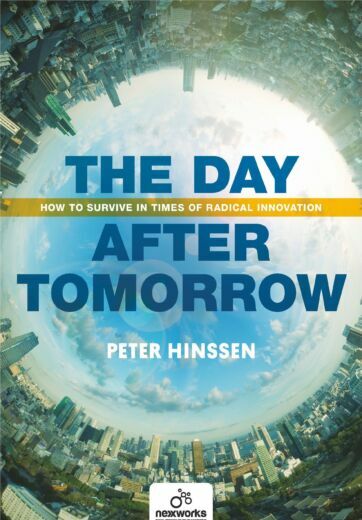 "Peter Hinssen’s radical and long-term view on organizing and innovation is as fascinating as it is insightful. This is a great read about the future of business, aimed at those who want to see the potential of this age of disruption."